Since ancient times, aloe vera is well-known for its beauty benefits and many skin-ailments remedies such as pimples, acne, zits and acne scars. The ancient Greeks and Romans used aloe vera for healing cuts & wounds and treating skin inflammation. Aloe vera is full of many skin friendly properties such as anti-bacterial, anti-inflammatory, astringent, scar diminishing and stimulus for cells growth; that all combined makes it very useful in removing pimples, acne, acne scars and treating many other skin damages. Besides all these, it is a rich source of essential vitamins, minerals, proteins, amino acids and enzymes that all are needed to nourish the skin to keep it acne free, healthy, smooth and glowing. Because of its moisturizing, healing and soothing skin-friendly properties, aloe vera is used as a potent ingredient in various beauty enhancement products, like moisturizers, face washes, soaps, sunscreen lotions, shampoos, conditioners, sprays, etc..
Aloe Vera Juice For Acne: Aloe vera juice gives best results to cure acne, when it is used in its purest form. In its purest form it’s a yellowish color liquid that flows after minimal damage to the aloe skin. Pure Aloe Vera Gel For Acne: In its purest form it is fleshy jelly-like inner part of the aloe leaves. However, most often aloe gel and juice are used together, as most popular recipes including aloe provide for preparing a mixture of minced leaves of this plant and other components. Can Aloe Vera Help Acne Cure? Aloe vera does have some powerful skin-healing abilities. However, it’s not only its glucomannan content that helps in acne and pimples cure. It’s the combined effect of aloe’s about 75 compounds that bestow it its powerful healing properties. Aloe vera also has saponin, a compound with anti-inflammatory, anti-bacterial, and anti-fungal characteristics that give it a tag-line “aloe vera for acne treatment”. Let us see first how aloe vera will help in acne and pimples treatment? (i) It contains hormones known as gibberellins, mannans and polysaccharides; these combined with its anti-bacterial property make it capable to help in exterminating the acne causing bacteria, including propionic bacteria that result into severe acne. Thus aloe for acne is an effective natural treatment. (ii) It also has salicylic acid, a compound that cleanses the pores and thus can help in preventing acne, pimples, blackheads and whiteheads. (iii) Dirt accumulation in the skin pores can block the pores, thereby causing bacterial infection and blackheads. Consistent application of aloe vera gelly on your face tightens the pores reducing the pores exposure to germs. (iv) It acts as a natural astringent that helps to remove excess oil, dirt and dead skin cells, which could otherwise clog your pores causing bacterial infection and acne break out. Being astringent, it also diminishes the size of inflamed nodules and cysts – thereby relieves pain caused by the swelling. (v) It works as a natural anti-inflammatory agent that helps to reduce redness, swelling and pain connected with pimples and acne. It also soothes the acne and pimples conditions. Further its anti-fungal properties are helpful in calming inflammation like swelling, boils and cysts. (vi) It also contributes to promote the cells growth, thus the damaged skin heals quicker and scars less. (vii) Aloe vera for acne scars: Its gel also reduces acne scars as it contains potent antioxidants that repair skin and help in regeneration of skin cells. It contains zinc, vitamin C and E that stimulate cells restoration and their growth, which can helpful in diminishing acne scars appearance and make your skin look flawless and smooth. (viii) However, it’s not yet proven that aloe vera cure the acne root cause, but it surely reduces the swelling, inflammation and redness associated with acne and pimples. How To Use Aloe Vera For Acne And Pimples Treatment? There are many ways to use aloe vera for acne and pimples treatment. Here are some of the best aloe vera pimples and acne home remedies. And the best of all is to have an aloe vera plant at home. If you don’t have it then you can buy it from a store or nursery and grow it in your kitchen garden or on even your windowsill. It neither costs too much, nor does it require too much space, water, any special conditions or care. (i) Take a fresh aloe vera leaf and extract its gel (cut open the leaf to squeeze out the pulp). (ii) Wash your face or the affected area using a mild cleanser and apply the gel directly on the affected area. (iii) Repeat this process for 2-3 times a day regularly, until you get relief from acne and acne scars. Preferably, you apply it before going to bed and leave it on overnight. (i) Take a fresh aloe vera leaf and extract its gel (cut open the leaf to squeeze out the pulp). Add in few drops of freshly squeezed lemon juice and mix the two together thoroughly to form a mask of uniform consistency. Transfer this fresh aloe vera concoction in a small airtight glass container and store in a refrigerator. (ii) Apply this mask on your face, neck and other affected area every night before going to bed and let it stay on overnight. Repeat this regularly every day, until your acne and acne scars are treated. (i) You will need aloe vera gel, a pinch of turmeric powder, honey, a couple of drops of rose water. Mix it thoroughly to form a uniform mixture. (ii) Cleanse the acne and pimples affected area of the skin, apply the mixture on the affected parts. Let it stay on for around 20 minutes and rinse it off thoroughly with cool water. Apply this natural remedy regularly, until you get rid of acne. (i) Aloe Vera Gel, Honey And Rose Water Acne Mask: Mix aloe vera gel, honey and rose water well to make a smooth paste. While gently messaging, apply this mask on the acne prone parts of the skin. Leave it on for 20 minutes and then wash it off with cold water. Repeat applying this mask regularly until you get relief from pimples and acne. If you want to use this mask for brightening your skin as well, simply add in a pinch of turmeric powder to the paste. (ii) Aloe Vera Facial Mask: Take a fresh aloe vera leaf and boil it in clean water for few minutes. Blend it to make a smooth paste and mix in honey well to form a paste of uniform consistency. While gently messaging, apply this mask on the acne prone parts of the skin. Leave it on for 20 minutes and then wash it off with cool water. Apply this mask regularly until you get relief from pimples and acne. If you want to use this mask for brightening your skin as well, add in a pinch of turmeric powder to the paste. (iii) Aloe Vera Jelly And Clay Acne Mask: This homemade recipe is ideal for fast cleansing, healing, drying of pimples and reducing inflammation. Take a tablespoon of cosmetic clay (white or pink) and mix it thoroughly with fresh aloe vera pulp extracted from the aloe leaves to make a smooth paste of uniform consistency. Apply the paste on to the cleansed acne / pimples affected parts of the skin, leaving it on for about 20 minutes. Rinse off the mask gently with cool water. (i) Use organic aloe vera soap regularly twice a day for washing your face and other acne prone areas, once in the morning and once at night to control acne and further breakouts. Look out for an aloe vera soap that contains glycerin as well, so as not to get your skin dry and flaky. (ii) Alternatively, you can use aloe gel acne lotions, gels, creams, moisturizers to apply on your face and other acne prone parts of your skin to reduce the acne breakouts and appearance of acne scars. Aloe vera works as an anti-inflammatory agent that helps to heal the scars naturally. It has been seen that the newer scars fade sooner than the older scars. Older scars take much longer time to fade out completely. However, aloe for acne scars can be great help if its use is combined with other acne scar treatments. (ii) Wash your face or the affected area using a mild cleanser and apply the gel on the acne scars. (iii) Repeat this process 2-3 times a day regularly until you get relief from the acne scars. Preferably, you apply it before going to bed and leave it on overnight. Tip: If fresh aloe vera gel is not available, you can use the organic and pure gel available in drug stores. Follow the directions given on the product label. Which Aloe Vera Should Be Used For Acne Treatment? 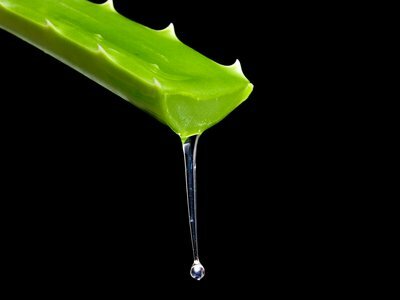 Aloe vera gel that is freshly extracted / squeezed from an aloe leaf is unquestionably more potent, because it has the entire natural wherewithal to treat acne and its scars. On the other hand, pasteurization and storage bring down the vital glucomannan, vitamin C and antioxidant amounts in aloe. Thus any aloe product you buy will be less effective than the fresh-off-the plant gel. Will Aloe Vera Help Acne? Aloe vera gel is a great non-invasive acne scar treatment to try. It can make the acne and its scars heal faster than they normally would. However, this is a surface treatment and may not get you rid of the root cause. So, it’s an effective natural remedy to treat your inflamed acne. Make sure if you find that you are allergic to aloe vera gel topical application then discontinue its use. Awesome ideas for using aloe vera!